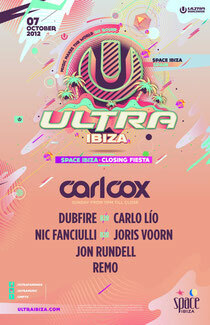 Space Ibiza has the key to close this summer season in Ibiza and Miami’s Ultra Music Festival will again be in charge of the Outdoor Car Park Area for this weekend’s Closing Party, hosting the Ultra Ibiza Stage for the occasion. 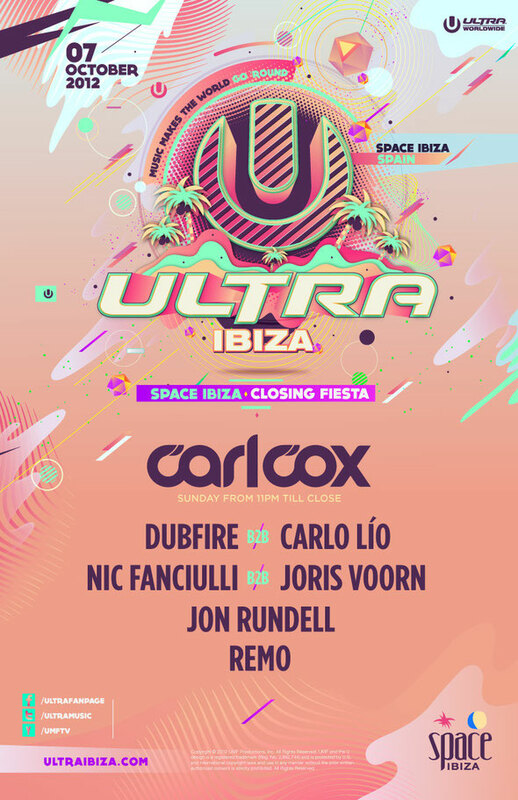 Space Ibiza and Ultra, who also hosts massive festivals in the USA, South Korea, Brazil, Argentina and Chile have prepared for October 7th a pretty heavy line-up. Starting at 4.30pm, a large number of top-level DJs and artists will be heading up to the various stages and booths divided in six different floor spaces which Space Ibiza has prepared for the event. Relations between the recently awarded “best global club” - Space Ibiza - and the “best music event”- Ultra Miami - have become stronger year by year, establishing a double musical window that hosts some of the most respected and acclaimed artists in the planet. Carl Cox, Dubfire b2b Carlo Lio, Nic Fanciulli b2b Joris Voorn, Jon Rundell and Remo. Carl Cox, Richie Hawtin, Dubfire, Nic Fanciulli, Joris Voorn, Magda, Guy Gerber (live), Paco Osuna, Radio Slave, Nina Kraviz, Gaiser (live), Nick Curly, Jon Rundell, Carlo Lio, Matador (live), Ambivalent, Edu Imbernon, Saytek (live), Wally Lopez, Danny Avila, Juanjo Martin, Albert Neve, Sebastien Drums, Danny Leblack, Rafha Madrid, Ramon Castells, DJ Mkyris, RioTGeaR, Oscar Cano, Marcoloco, Mr. Doris, Daisy Heartbreaker, Allan Ramirez, Paul Reynolds, Rad Damon, Space Ibiza Residents: Camilo Franco, Remo, Danny Marquez and performances by Foc I Fum.